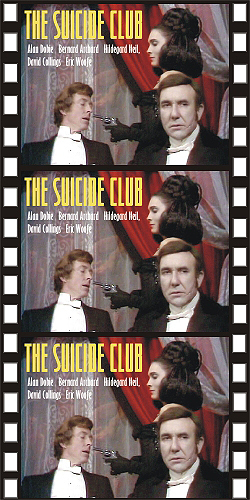 THE SUICIDE CLUB (1970) Alan Dobie, Bernard Archard, Hildegard Neil, David Collings, Eric Woofe. Dobie is great as a Bohemian prince who discovers a secret club where desperate men agree to draw cards to see not only who will die (the ace of spades), but also who will kill him (the ace of clubs). Dobie, of course, seeks to end the club. He and his attendant soon become members. Unfortunately, they find themselves squarely behind the ace of spades. This TV movie is only marginally a horror film, but it’s strong in gothic content and contains several horrific moments. And frankly, it’s just a helluva good movie. Archard is exemplary as the villain, while Neil is ultimately sensual as his lady-in-black vamp. Way cool. Based on the tale by Robert Lewis Stevenson. Great color, from an original TV broadcast tape.